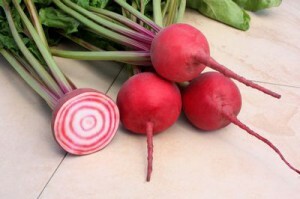 Chioggia Guardmark is an improved Italian heirloom beet variety that has excellent vigour, uniformity, and bolt tolerance. The medium-sized, globe shaped roots are deliciously sweet and peppery in flavour, and have firm not fibrous flesh. Its striking and unique bullseye pattern of bright magenta and white rings is sure to stand out in any dish. Above the light red smooth roots are the medium green tops that are packed with nutrients and mild in flavour. Excellent spring, summer, and fall performance. Extended periods of high temperatures lessens colour intensity.